It's easy to add a couple of eggs to any batch of rice, for lunch the next day. 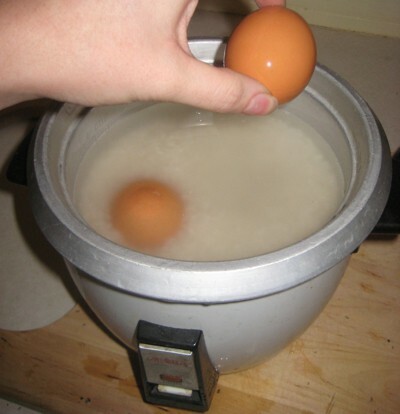 This is a guide about cook hard boiled eggs in the rice cooker. If you are cooking rice in a rice cooker you can also cook hard boiled eggs at the same time. After washing the rice and adding the proper amount of water, place a couple eggs in the cooker so that the water covers the eggs. The eggs will be hard-boiled by the time the rice is done. There will be a bit of cooked rice stuck on the outside, so pick off any big chunks. If you are going to eat them with your rice or use in a side dish, peel them. If you are going to save them for later, wash the outside and stick them in the fridge. I had never thought of this. What an interesting idea! When you open the egg, is there any of the green ring around the yolk? I have never seen a green ring around the yolk when doing this. Hard boil eggs at the same time you are cooking rice! Prepare rice in rice cooker as usual, then wash the outside of your eggs (I wouldn't do more than 3 in a 3 cup batch of rice). Then lay the eggs on their sides in the middle of the rice in the cooker. Start the rice cooker, when the rice is done so is the hard boiled egg. Then you can use the egg for your meal or stick in the fridge for later use.